Posted on November 4, 2016 at 12:34 pm. Support for the Proudly Pokies Free campaign is starting to grow after the inaugural Proudly Pokies Free event took place in Sydney in late October. The first event of its kind featured live performances from musicians including Tim Freedman of The Whitlams, The Preatures, Joyride, World Champion, Wild Honey and Bad Deep DJs, with the intention of raising awareness of problem gambling and reducing the number of poker machines in clubs and pubs across Australia. The campaign has already received major support from the City of Sydney, with Lord Mayor Clover Moore voicing his concern about the impact of the pokies on the city’s social and live music scene. The Proudly Pokies Free campaign is led by siblings Anna and Tom Lawrence, with the aim of making it cool for venues to operate without the financial benefits afforded by poker machine revenue. The team hopes to create change in Sydney and the rest of Australia by supporting and promoting businesses that choose not to offer pokies, and pushing for those that do to get rid of the machines. The campaign is forming roots in Sydney as New South Wales has more pokie machines than anywhere else in the world except for Nevada. NSW was also the first Australian state to legalise the pokies and houses over 50% of the countries 200,000 poker machines. Proudly Pokies Free is supporting, celebrating and promoting venues that don’t have pokies to help create a positive alternative vision for Sydney’s venue culture. Anna Lawrence said the campaign will soon start focusing on venues that currently do have poker machines in the hopes of “weaning them off” by proving that a venue doesn’t need gambling profits to survive. She said venues like Petersham Bowling Club have transformed their pokies rooms into stages and another venue changed its TAB room into a pinball room. 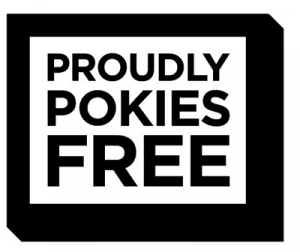 Proudly Pokies Free strongly supports Nick Xenophon, Andrew Wilke and The Alliance for Gambling Reform in their bid for a national pokies reform, including the push for $1 maximum bets and the removal of features that are designed to deceive. Want to stay in the loop of all the latest pokies and casino news? Bookmark our site and check back regularly for updates.